Can You Solve the Sphinx’s Other Riddle? One of the most celebrated tragedies of ancient Greece was Oedipus Rex, Sophocles’ play about the Theban king who unwittingly killed his father and married his mother. 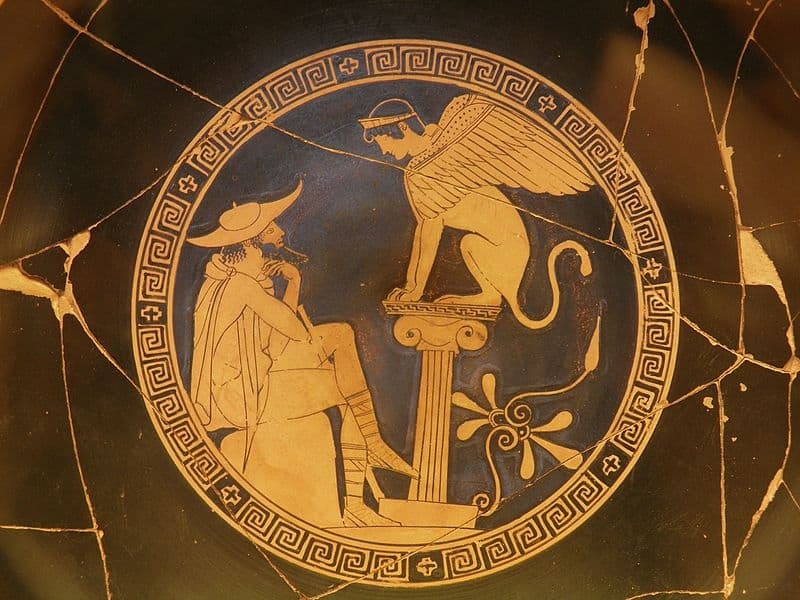 In order to become King of Thebes, Oedipus had had to solve a famous riddle – or should that be riddles? Oedipus was born to King Laius and Queen Jocasta of Thebes, but when Laius hears a prophecy that he will die at the hands of his son, he orders the child to be killed. The infant is left on a mountain to die, but a shepherd finds him and takes him in, raising him as his own son and naming him Oedipus (literally ‘swollen feet’, from the pins that had bound the infant’s feet together when he was found). When he grows up in Corinth, Oedipus learns of the prophecy that he will kill his father and marry his mother, and thinking that the shepherd and his wife are his real parents, he flees the city in order to ensure such a fate never befalls them – only to run into his biological father, Laius, on his way to Thebes. The two men fight and Laius is killed. Oedipus then arrives in Thebes to find that the king has recently been killed, but poor Swollen-Foot doesn’t think to put two and two together. Instead, he becomes king, marrying the widowed queen (whose name is – you’ve guessed it, Jocasta) and having children with her. Later, Oedipus learns of what he has done, and blinds himself; Jocasta, upon learning that she’d borne her own grandchildren with her son, hangs herself. We’ve written about the story of Oedipus previously, in our brief history of tragedy. The story of Oedipus gave Sigmund Freud, father of psychoanalysis, the idea for his theory of the ‘Oedipus complex’, where every male child harbours an unconscious desire to do precisely what Oedipus inadvertently did. The child has to repress this desire, but is often only partly successful (Shakespeare’s Hamlet, for instance, doesn’t fully manage it, according to Freud’s reading of the play – a fact that numerous theatre and film directors have seized upon, especially when portraying Hamlet’s frustration at his mother’s remarriage to his uncle). If such a family set-up sounds as unconventional as Oedipus’ own, then the answer at least puts us at our ease. The two sisters are ‘Day’ and ‘Night’. Perhaps the Sphinx should perhaps have stopped at the first riddle. It was certainly her stronger material. And she did the right thing in choosing to open with it. Image: Oedipus and the Sphinx of Thebes (author: Carole Raddato), Wikimedia Commons. That was my guess, too. However, had I been a editor in ancient Greece I’d have thrown away the manuscript to this tale of woe. Poor Will — I think he’d be astounded to know what Freud has read into Hamlet’s grief. Yes, mine too; sun and moon seemed to be the most obvious pair. la mythologie grec, c’est ma grande passion. Very interesting literature indeed ;-) Thanks for sharing. day and night ..is perfect.. In high school I took a Greek mythology class. It was fun. ok i got it instantly !